One serving counts as 3 of your 5-A-DAY target of fruit and vegetable portions. 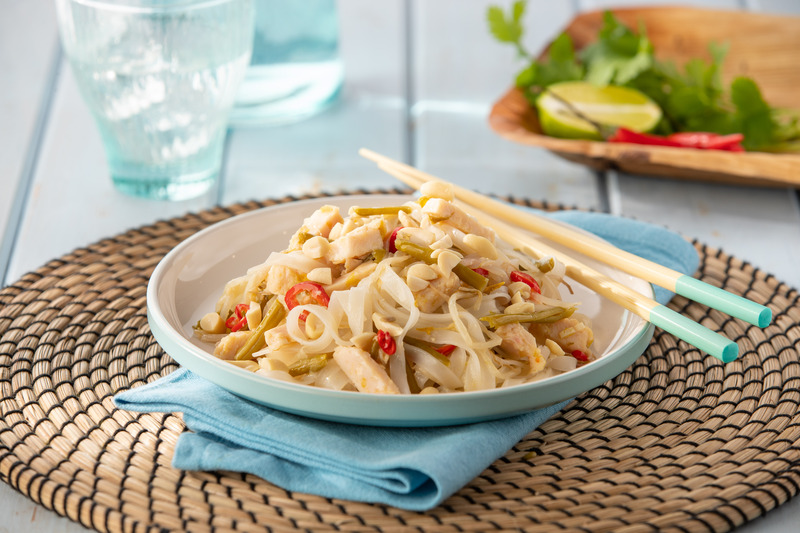 The first recipe in our ‘Family Fakeaway’ series is here – a delicious Chicken Pad Thai. It’s filled with canned vegetables that count towards your 5-a-day! Take a look at the recipe below to create your own Thai food using canned ingredients. Fry the garlic and chilli in the oil for 1 - 2 minutes. Add the chicken, beansprouts and green beans, continue cooking for 2 - 3 minutes. Stir in the fish sauce, lime juice and toss around the cooked noodles, until heated through. Push the noodle mixture to one side of the pan, pour in the egg and quickly stir through the noodles as the egg cooks. Sprinkle over the peanuts and serve immediately.